"318-Crystal Cascade near Portage Bridge, Portage, N.Y."
This small creek flows into the River on the bank above the Upper Falls. Mr. Letchworth and his Nameless Society gave it the name "Degewanus" in honor of Mary Jemison. Although small, it attracted several photographers. This was probably due to its accessibility - it lay along the path from the Portage Bridge to the Middle Falls and Glen Iris. 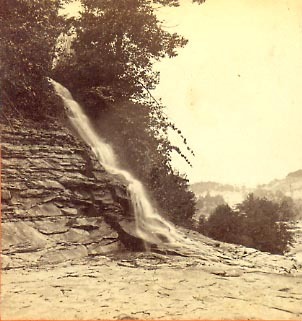 This first view was taken on the rocks above the Falls near the western bank. The "Crystal Cascade" is tumbling down the shale bank where it will soon join the Genesee in its journey down the Portage Gorge. 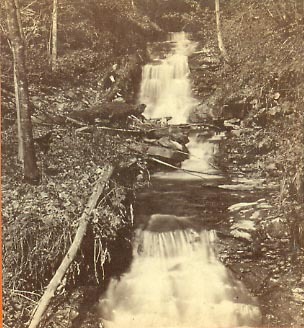 "256-Mountain Cascades, from Rustic Bridge, Portage, N.Y"
David Gray, long time friend of Mr. Letchworth, described the Creek for readers of Scribner's Monthly in 1877. 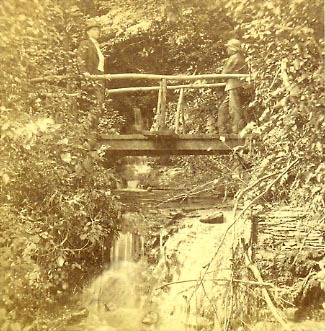 "From the west end of the (Portage High) Bridge the descent into the Glen is made by the aid of flights of rustic steps and a steep path through thick woods of beech, maple and hemlock, leading to the margin of the stream. Halfway down, and crossed by a footbridge, a little brook, christened by the valley folk De-ge-wa-nus, - an Indian name of note along the Genesee, - dashes headlong from the mysterious green darkness of the upper forest...."
"312 - Rustic Bridge and Cascade, Portage N.Y."
Here is the footbridge across Degewanus Creek. The photographer has moved off the footbridge where he took the image shown above, and set up his camera in the creek bed between the bridge and the riverbank. The result is an image with an outstanding stereo effect. 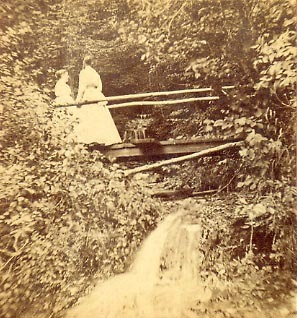 Two women, perhaps on a summer day's excursion to Portage, are resting in the cool shade of the creek bed. "786.-Crystal Cascade, near Portage R.R. Bridge." "Views on the Line of Erie Railroad"
The same setting is captured by yet another photographer perhaps a few years later. Some improvements have been made to the footbridge, and minor changes to the creek bed - perhaps the results of a spring freshet - can be seen. One might also note the freshly broken branch hanging in the tree to the right. It is possible that the photographer had to break the branch in order to open the view for his photograph. "42 - Cascade and Rustic Bridge near Upper Fall"
"Portage Bridge and Falls on Genesee River, NY"
It is clear that the setting was popular to the stereo photographers of the day. Given the fact that not far away were the wonders of the Portage Gorge - why spend precious time and light photographing a scene easily found on any "common" brook? 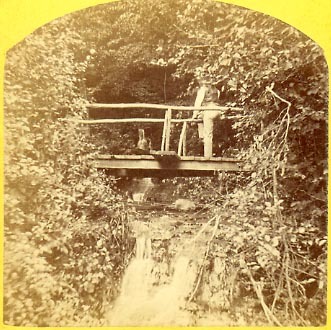 It may be that the trained eyed of the photograph realized the wonderful stereo effect that he could produce, using the tumbling creek, rustic bridge, and the small cascade beyond. Or perhaps it had to do with the fact it was the first "rest-stop" on the difficult walk down the steep path from the track? Perhaps the photographer simply took the opportunity to set down his camera and bulky equipment and shoot an easy (and cool) scene! 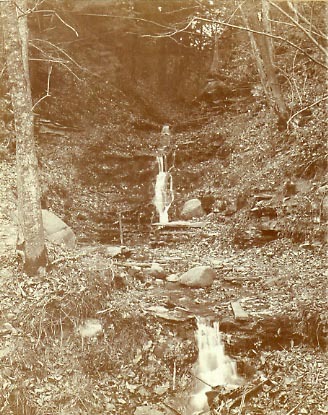 "View in Glen Iris Park, Portage N.Y"
We are not sure whether this is yet another view of De-ge-wan-us Creek or, more likely, another "crystal cascade" near the Glen Iris. We are sure, however, that every photographer, amateur and professional alike, finds that in Letchworth Park even the most "common" scenes takes on a special quality that demands attention - if you don't believe us, check through the photographs you took on your last trip to the Park! Incidently, a footbridge still takes visitors across Degawanus Creek on the path to the High Bridge. It is concrete now - the old wooden bridge disappeared early in the last century. But standing on the modern footbridge one can still enjoy the brook that "...dashes headlong from the mysterious green darkness of the upper forest...." just as visitors did over a century ago.